Earlier today, Microsoft CEO Steve Ballmer sent out a memo to the company detailing a reorganization plan that aimed to change the way Microsoft created its products. We took the time to slog through the entire memo and distill it into a more readable format, but it looks like the good folks at The Joy of Tech have distilled it down even more. As we were digging through, it did seem a bit strange that Ballmer was talking about how Microsoft needed to be more "lean and efficient" and the memo itself was actually split into two memos because it was so long. So it goes. Ballmer. This guy has got a couple screws loose. He's basically a loud over the top cheerleader. He doesn't really surround himself with the absolute best either. Kinda hard to take him serious. Not a apple fan but at least Steve Jobs had the sack to say "don't even bother trying to figure out what the public wants next, because by the time you do, they want something different." Well if anything he's a blast to watch. He may or may not be the best man to head Microsoft, but he's truly passionate about the company and he knows how to show it. Examples: http://www.youtube.com/watch?v=hMLcKtVwF-A and http://www.youtube.com/watch?v=wvsboPUjrGc Edit: Also, the quote you're referring to is talking about 'the time you finish building the product' that they want something different. That sometimes you need to anticipate and build what the consumer didn't know they wanted. Hahaha that was just awesome, look at the people down there, thanx Michael. Huh, doesn't make much of a difference. They were doing that before they got that letter anyway. Microsoft has become a copy of the old IBM that they critiicized and dethroned in the 1980's as they built their Windows monopoly to replace the old IBM monopolies. Bill Gates had a trust fund at 18 and his buddy, Paul Allen, was the generator of all the original ideas for DOS. Bill Gates then tried to screw his friend, Paul Allen, out of his ownership of Microsoft. Gates then utilized his monopolistic power to buy or destroy many innovative companies and today Microsoft is simply a monopolistic, mindless criminal monopoly and Gates avoids taxes by forming a non-profit foundation that has accomplished little except to provide employment for his family. 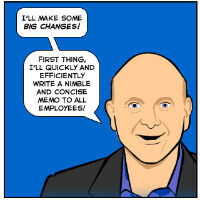 Ballmer is the perfect, structured tired old militaristic CEO to lead them into the past.